Carol and Naomi with cousin Barbara Fischlowitz-Leong at Kahala Beach Park, where we enjoyed a beautiful sunset picnic with Barbara, Michael and Sara (in 1999). Grandma and Grandpa’s house is located in the background just to the right of Barbara’s head. With Arlen and Patty’s family at Barbara and Michael’s old house in Kahala several years ago. The following year we showed up at the house and surprised the couple who was currently living there because Barbara had neglected to tell us that they had moved. However, the couple was very nice (even though we showed up at their doorstep with all our swimming gear and with the obvious intent of swimming in their pool) and they even let us use their phone to call Barbara and find out where we were supposed to go. We saw Robert Cazimero (one of the well-known performers that afternoon) just as we were arriving and walking into the crowd from the shuttle bus from Diamond Head Theater’s parking lot (a very convenient system, we found). The Cazimeros (Robert and Roland) are two of my Mom’s favorite entertainers and Pua Hone, one of their songs, was played at my parents’ wedding, so we knew it was a good omen. We tried to find a nice spot in the shade after sitting in the hot sun for about half an hour. Dad found a good spot in the shade after walking around a few people including a woman lying down asleep on the grass so we settled there and were enjoying the music and dancing for awhile. After a half hour or so, the sleeping woman who we carefully avoided stepping over got up and said, “Oh, my God!” It turned out to be my beautiful red-headed cousin Sara (third from the left in the back row in the picture above), who was there enjoying the concert with her two friends from Denmark. She said she woke up and saw the three of us in profile as a group and couldn’t believe what she was seeing. We hadn’t notice that it was she lying there the whole time and she didn’t expect to see us there sitting next to her. “How random!” she kept saying. Of the thousands of people in the crowd there, what was the chance of sitting right next to her? Ho, so small the place! We later had another nice picnic at the same spot as last year (top picture) and had another good laugh about our random encounter at the bandstand. July 2004 — Barbara on her “soapbox” with Michael supporting her. Barbara’s mother Mrs. Parker on the left. We were trying to convince Barbara to run for political office. Seated around the Shabbat table at Barbara and Michael’s home. Michael, Barbara, Barbara’s sister and mother. Mrs. Parker, Barbara’s mother, is a very healthy 90 years old this year (2004) and still remembers enjoying a Thanksgiving dinner at our house when she came from St. Louis, where she used to live, to visit the Bay Area with Barbara. She now lives in Hawai‘i Kai. With cousin Sara (center) and friends. Barbara, Mom and Michael at Izakaya Nonbei Japanese restaurant in Kapahulu, whose interior is beautifully decorated like a traditional Japanese country inn. 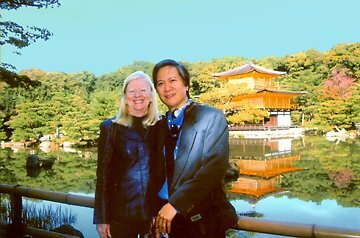 Barbara and Michael loved visiting Kyoto — and then Bhutan — during 2004. Here they are at Kinkakuji with the “Golden Pavilion” in the background. For more pictures of Kinkakuji, click on Sakamoto, “Dad visits me in Japan,” page 2.